If you are a gambler from the UK, you should have seen the “Grosvenor casino” logo literally everywhere: This is the biggest gambling group in Britain. In addition to the online casino service, they have a brick and mortar casino in almost every city in the UK. Grosvenor defines itself as the “UK’s largest multi-channel casino operator” and this is not just a marketing claim: It is the truth. However, is it the right casino for your needs? In this Grosvenor review, we will evaluate this famous brand in detail and take a look at its features, especially bonuses. The Grosvenor casinos were established in 1970 as a subsidiary of the Rank Group. In the year it was founded, its name was “County Club” but in a very short time, it changed to Grosvenor. Before 1970, the County Clubs were bingo clubs spanning almost the whole of England, and the transition to the Grosvenor brand transformed these clubs into brick and mortar casinos. In other words, Grosvenor was not established as an online casino. Initially, it was a physical casino chain. The chain consisted of 55 casinos operating in the UK, Belgium, and Spain. 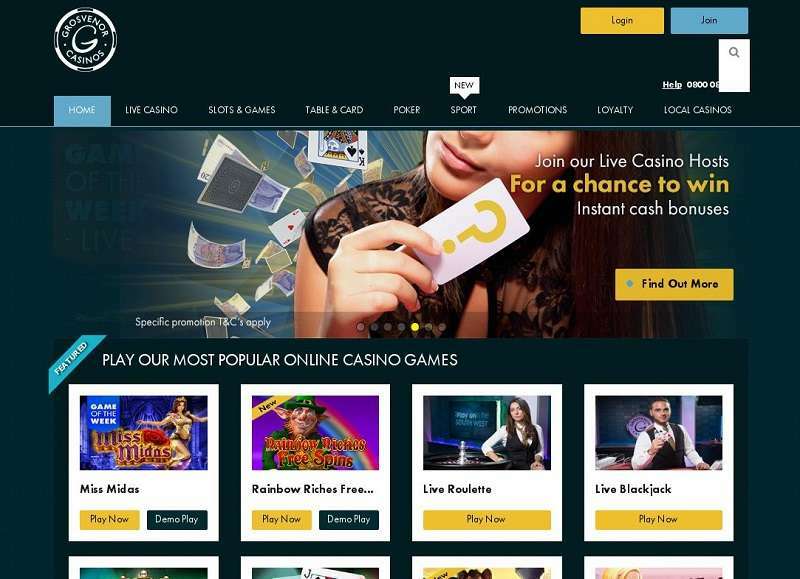 The online casino of the brand opened in 2007. 3 Which Services Are Offered? 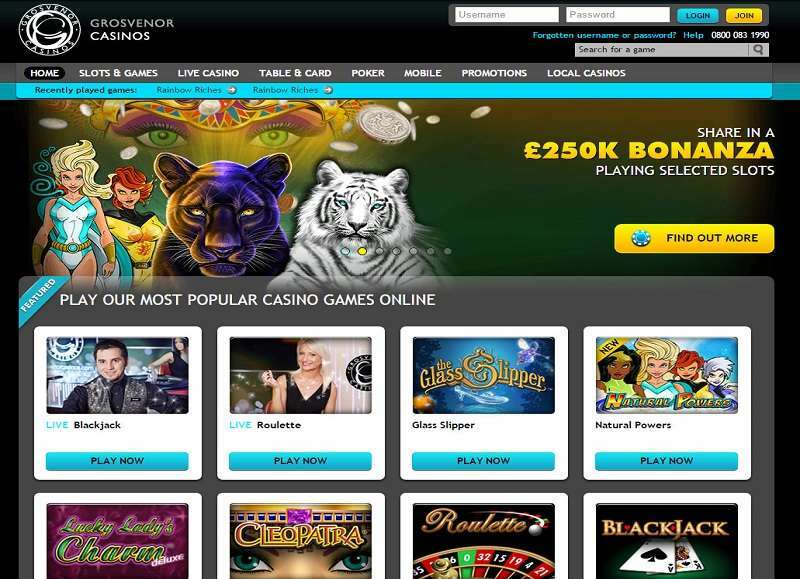 Grosvenor: The main online gambling service in the UK and Belgium. MECCA: Licensed bingo and lottery clubs (real world buildings) in the UK. ENRACHA: Licensed bingo, lottery, and arcade clubs in Spain. Only Grosvenor earns 400 million sterling per year alone and is visited by more than 8 million people every year. The Grosvenor brand currently has 56 brick and mortar casinos, of which 54 are in the UK and two are in Belgium. The company has about 7,000 employees and its shares are traded on the London Stock Exchange. Rand Group does not have an online casino brand other than Grosvenor. In this context, it can be said that the Rand Group is the biggest gambling group in the UK. For the same reason, the Grosvenor brand has unique credibility and reputation. Grosvenor website uses a fairly classic design, which mostly consists of black and blue colours. In general, it looks plain. Bonus campaigns and lists of the games are located on the main page. Thanks to the menu at the top of every page, it is very easy to navigate, and there is no difficulty in this regard. However, you cannot list games by a specific provider. So, if you want to see only specific provider’s games, for example, you cannot do that. Thanks to its simple design, page loading speeds are quite satisfactory and there are no delays. 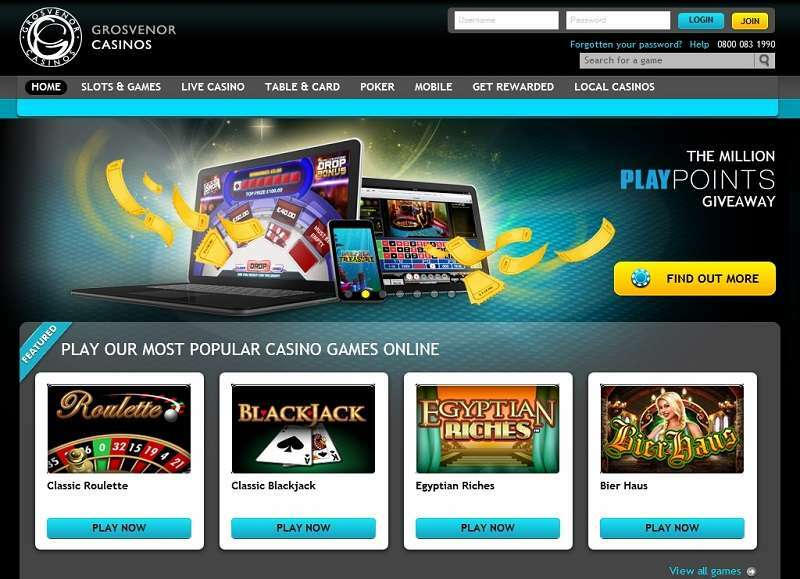 Grosvenor is an “Instant Play” casino, so you do not need to install a program to play games. You can start playing all of the games over your browser and within a few seconds. Moreover, “demo play” option is offered for all. Even if you are not a member, you can try all the games offered for free – no download is needed. Grosvenor casino is licensed by the United Kingdom Gambling Commission and Alderney Gambling Commission. Under normal circumstances, these licenses give the right to offer gambling services to many countries. However, the Grosvenor casino currently accepts only citizens of the following countries: Great Britain, Ireland, and Gibraltar. If you live in a country other than these, it is not possible to join the casino. For the same reason, the website can only be displayed in English. The accepted currencies are GBP and EUR. All pages of the Grosvenor site are encrypted with 128-bit SSL provided by Symantec and the website complies with all responsible gaming practices. In other words, you can put many restrictions on your account, such as limiting the maximum bet amount that can be placed or limiting the hours you can play. Grosvenor has a fairly impressive security infrastructure and allows you to transfer your membership information from the brick and mortar casinos to the website. Grosvenor does not have any native mobile applications. So it does not offer an option that you can download from official application stores. However, since the website has the HTML5 infrastructure, it can be seamlessly viewed on all mobile devices. So whichever operating system you use, you can access the mobile version of the site via your mobile browser. This version is not different in terms of performance and features. You can play games, do account transactions, access customer service, and even play live casino games. Although no native application is a disadvantage, it is still possible to take advantage of all mobile gambling features. Grosvenor works with a total of 20 providers. These include brands that almost everybody knows, and they are Playtech, Netent, Bally, IGT, WMS, and Novomatic. In addition, indie studios offer their entire game collection as well, and they are Cozy Games, Endemol Games, Fremantle Media, and Probability Gaming. There are more than 1,000 games in the collection, and they offer a rich content that can appeal to every liking. It is also possible to find table and card games (roulette, baccarat, video poker, blackjack, etc. ), although the majority of the collection consists of slot machines. The vast majority of the games provide full support for mobile devices. You may experience some problems only with some games that still run on the Flash platform. These kinds of games only work on Android-based devices. Surprisingly, Grosvenor uses Evolution Gaming and Extreme Gaming infrastructures for this service. So it is using a white label service. The reason this is surprising is that Grosvenor has its own brick and mortar casinos. In other words, live casino games could be broadcast from one of these places. 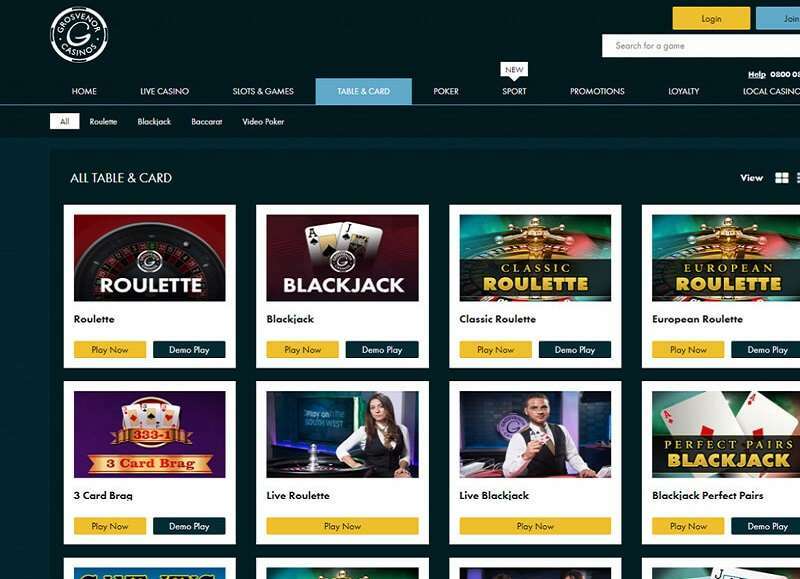 A total of 16 games are available in this category, and the offered options are roulette, blackjack, baccarat, and blackjack. Classic La Partage is among the recommendations. It is possible to find a game at any time of the day and all dealers broadcasting from the UK. In this context, Grosvenor casino developed a mobile app just for live dealer games too. You can download this app (which is developed for iOS and Android) from official application stores. The app only supports live casino games. The broadcast quality is satisfactory in general, and there is no lag problem. This service is limited to UK leagues except for a few global leagues. E-sports betting option is not offered. The number of sports supported is few and the average odds are not very high. It is nice to be presented as an option, but sports betting service is not as advanced as to attract bettors. In addition to video poker games, you also have a chance to participate in poker tournaments that you can play against real players with real money. This service consists of a small-scale poker network and has its private tournament called GUKPT (Grosvenor UK’s Best Poker Tour). You can use some of the bonuses you get at Grosvenor brick and mortar casinos at the online casino as well. The fairness of the games is regularly checked by independent third parties, but Grosvenor casino does not publicly announce its RTP rates. Deposit at least 20 GBP (This should be your first deposit). You will get an additional 20 GBP instantly. You can use this bonus to play games and/or withdraw it. However, in order to do this, you must complete a 5x turnover requirement. This means you need to wager 100 GBP first. This requirement must be fulfilled within 30 days or it becomes unusable. If you make a withdrawal before completing the requirement, the bonus amount will be deleted from your account. Game of the Week: The casino management picks a random slot machine/jackpot game every week. Members who deposit at least 30 GBP to that game will receive an additional 5 GBP for free. This offer is subject to a 30x turnover requirement. So if you make a profit with that 5 GBP, you need to wager 150 GBP first in order to use or withdraw it. Prize Draws: Grosvenor casino organizes regular prize draws which award the members real-world trips. It is free to opt into these prize draws and winners are randomly selected. Loyalty Club: The casino offers a VIP club and a loyalty points system. By playing games and placing bets, you keep winning points, which you can convert to real money. VIP club members also get personal account managers and special-personal bonuses. The VIP membership is “ invite only,” and you can apply from land casinos too. Please note that Grosvenor casino offers additional bonuses for sports bettors too. However, since the focus of this review is the casino service, we are not mentioning those. In any case, do not forget that members of brick and mortar casinos are more advantageous in terms of bonus conditions. So, if you live in the UK, try to visit a land casino first before becoming a member of the online casino. Local Offices: You can go to the nearest brick and mortar Grosvenor casino for support. The biggest gambling brand in the UK. Offers brick and mortar casinos too. There are multiple ways to reach customer support, including talking with a real person face-to-face. Offers a poker network and a big poker tournament. If you are interested in classic gambling and a resident of the UK, Grosvenor casinos are the best option to gamble. You can start playing at the online website and continue your experience via brick and mortar casinos. It is hard to find a more reputable brand than Grosvenor in the UK: It is in the “most recommended” lists of many reviewers, and there is a reason for this. You can play at Grosvenor casinos without a worry in mind because it is one of the highly recommended casinos too.